We already try to measure how much energy is invested (EROEI) in the production of energy, but I have a hard time finding numbers on the materials invested. For example: What is the total energy a wind turbine produces in it's lifetime divided by the total mass of all the materials consumed in its construction, operation and and maintenance? Of course it would be even more interesting to know the kind of materials invested. I've yet to see a meaningful metric that relates directly to materials, other than the EROEI (Energy Returned On Energy Invested); and there's discussion about whether or not EROEI is at all a useful measure: its probably not that useful, since once it's over 1.0, it's completely subsumed into the economics. The same would be true of a more explicitly materials-based index: it's completely subsumed into the economics. As THelper hints at in the comments, calculations of energy inputs, and other lifecycle cost analyses (LCAs), do usually work from a quantified list of materials that are used in construction, operations and decommissioning. So most detailed LCAs will contain such a list. It will vary depending on whether the turbine has a permanent (neodymium) magnet or not; whether it's onshore or offshore; and if offshore, what sort of foundation / tethering is used. 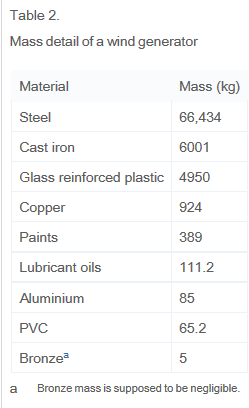 Energy out per unit kilogram (kg) mass input seems like a strange measure, as it equates a kg of water, a kg of oxygen, a kg of steel, a kg of platinum: I can't really see how that's at all a useful measure. = about 300 GWh of electricity generated over the lifetime, and about 40 kilotonnes of material. 660kW turbines are quite small, these days: 2-3MW is more common. So the above windfarm isn't really that representative. 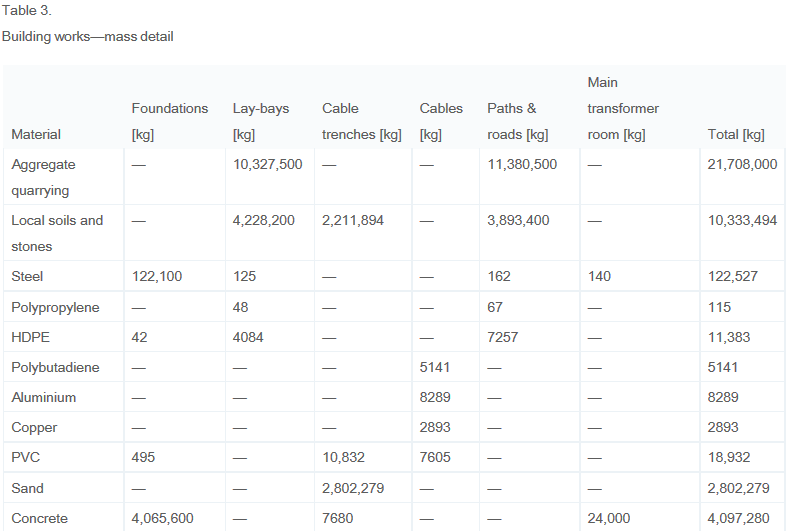 Also, the amount of material used for roads and lay-bays could vary a lot, depending on the specific site configuration. Almost all of that material would be re-usable at the end of life of the farm: the aggregates, soil and stone could be directly reused; the steel would be recycled; and the concrete reused as aggregates. So picking a divisor is tricky - without detailed information on recycling and reuse rates, the number of generations of windfarm served by those 40 kilotonnes of materials is hard to determine, so one might end up picking an abritrary number of generations, changing the end result considerably. Not the answer you're looking for? Browse other questions tagged energy renewables life-cycle-analysis electricity-generation manufacturing or ask your own question. What is investment/outcome ratio for wind energy in terms of energy (EROEI)? What is the scrap value of wind renewables? Are there projects that use renewable energy sources to create renewable energy sources? What form of electrical lighting has the smallest energy-footprint? Cost-effective alternative to rechargeable batteries? How effective are “GreenUp” (opt-in utility company green energy) programs? How accurate are consultant pre-construction energy assessments?